The way up is almost perpendicular to the frozen ground. The glacier looms over me like a white predator, silent, and patiently waiting for a victim to wander into its steel jaws. 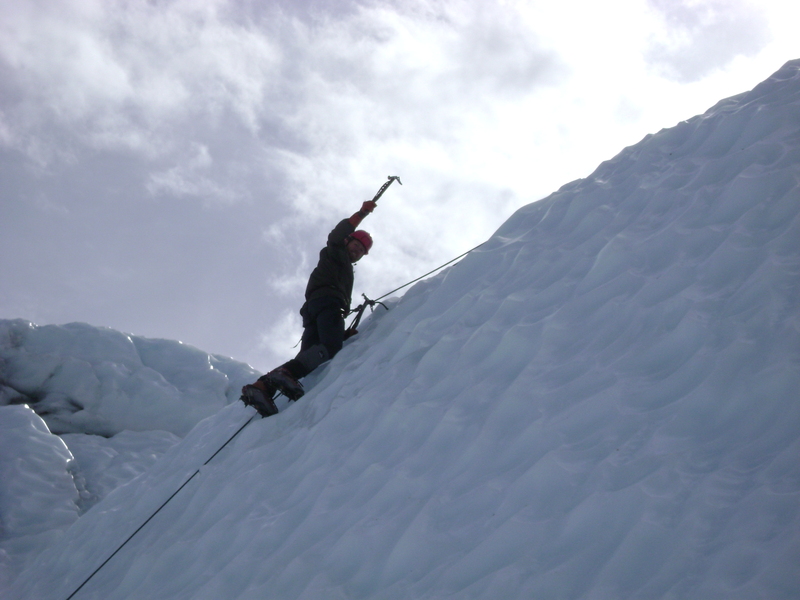 Snow anchors are set at the top of the glacier. 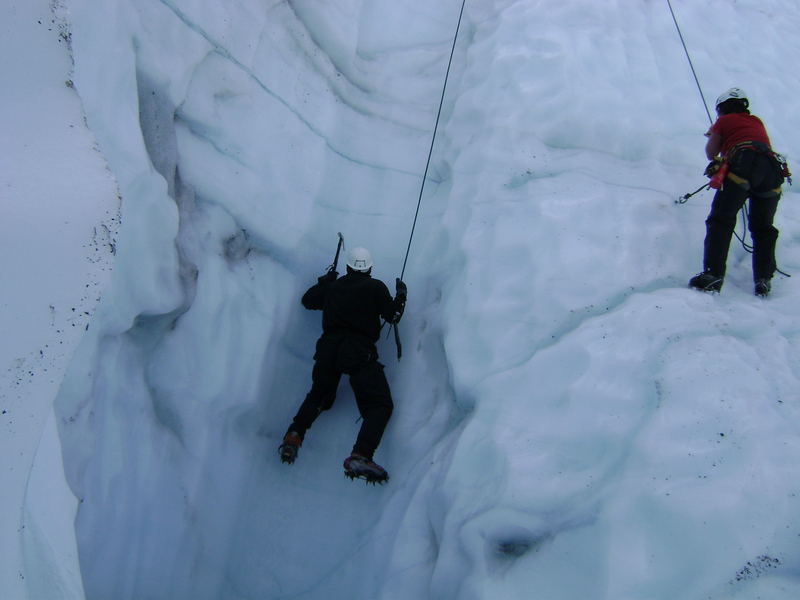 I am roped in with my harness, helmet on, goggles, and an ice axe in each hand. The sun scatters light across the rock and ice strewn fields. These blue and grey colors I have never seen in such a landscape. This place is foreign, or from another time. I have stepped backward in some geologic time machine. Looking back up at the white wall in front of me, nervousness becomes fear, which erodes the trust that is required to complete this climb. The guide who set the anchors, and is now ready to belay, gives words of encouragement through small-talk. Now is the time to start: setting one axe in the ice a reasonable amount above my head, and then the other. Next are the crampons on each foot. With a downward motion, the spikes on the front are kicked into the ice to provide an anchor and leverage for pushing upward. Sometimes the kick was not hard enough, deep enough, or the snow and ice were not good enough. Kick again until you feel comfortable and secure before continuing. Time to be like spider-man and work my way up the ice in this pattern until the top is reached. What a view from the top, and the feeling inside is overwhelming. And then the realization sets in that I have get back down somehow, And this is where I freeze for a moment. Many thoughts and outcomes cross through the mind. One of them being, if it is your time to go, is there a better place than here in Alaska. Not really. 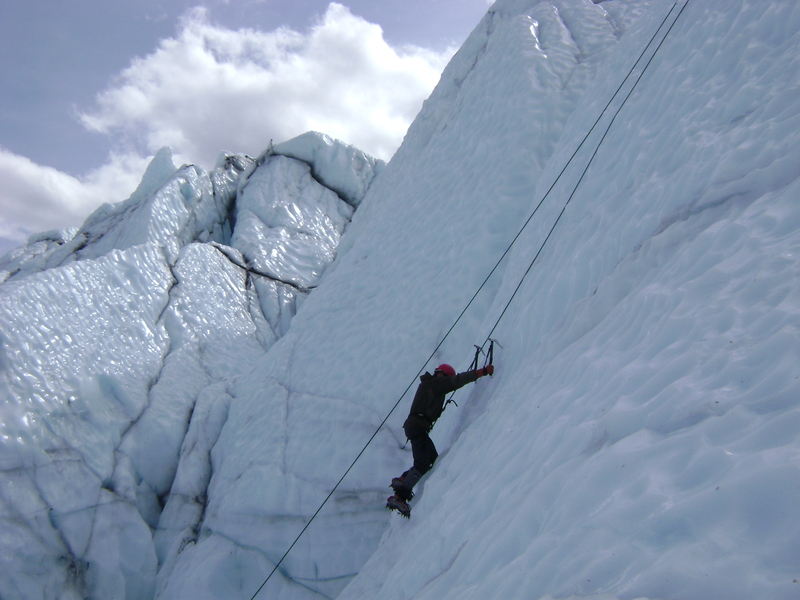 The best way down, besides being lowered via the belayer is to put the ice axes away, grab the rope that is attached to your harness, lean back (with a huge amount of trust) and walk down the side of the glacier. 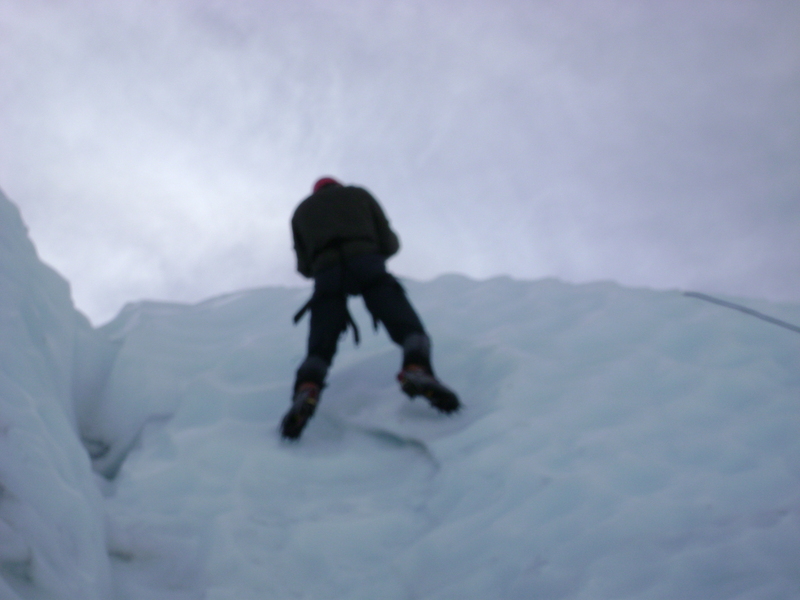 Back on level ground, the moment sinks in, and the adrenaline turns from nervousness and fear, to a huge sense of accomplishment. And of course with anything that we overcome, any obstacle, once we are over the top, we most likely want to do it again. Two more trips up the glacier were made, before the day ended and we headed to Palmer for an event rest and early starting for hiking in the Talkeetna Mountains. 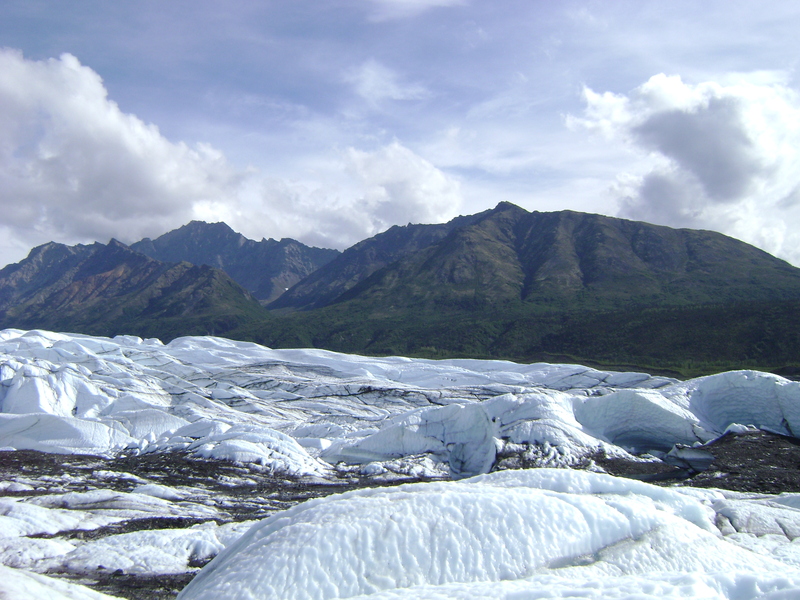 This entry was posted in Essay, Mountains, Nature, Photography, Places and tagged Alaska, climb, climbing, fear, ice, matanuska, matanuska glacier. Bookmark the permalink. Truly spectacular! I love your spirit! Thank you, I appreciate that. Hopefully that spirit will carry me to the top of a mountain!